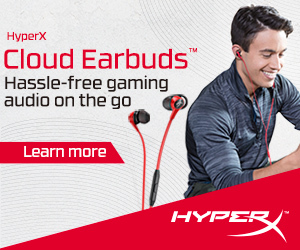 Disclaimer: This article isn’t sponsored by Play-Asia.com or PlayStation. With the release of Monster Hunter: World, Sony decided to also launch a promotion for its PS Plus subscription that gives you an extra three months when you purchase a 12-month subscription. They released a very limited supply of physical cards that quickly went out of stock from many stores in the metro including Datablitz and Game One PH/i.Tech so the only way to avail of the promotion was to purchase it via the PS Store. But while users who have a Hong Kong-based account have no problem using their local credit cards to avail of the promotion, those with Singapore-based accounts aren’t able to use local credit cards. 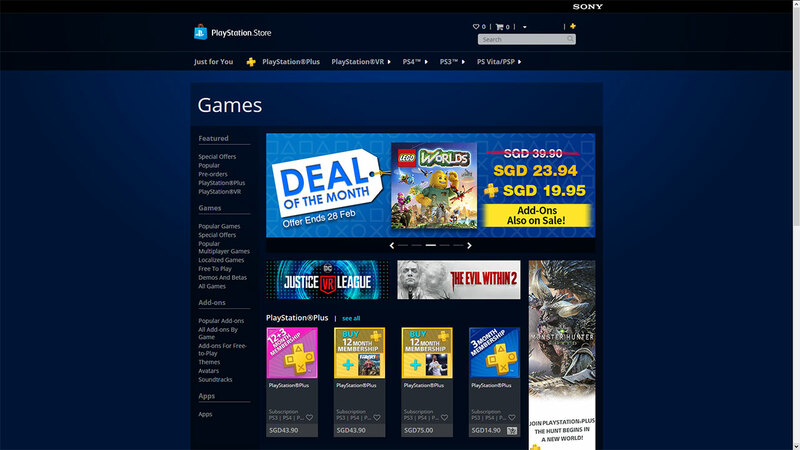 So we decided to come up with a simple guide on how to purchase PS Store load to not only purchase the 12+3 PS Plus subscription promotion but to also purchase other stuff from the Singapore PS Store. 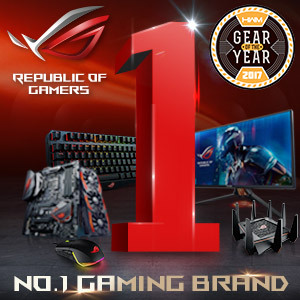 The first step is to purchase a PSN card from Play-Asia.com – one of the longest running online marketplaces for gaming products. 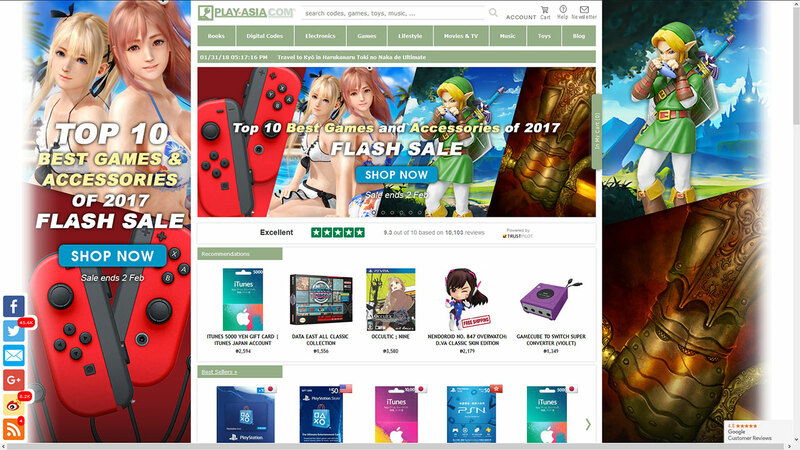 Play-Asia accepts local credit cards as well as PayPal so users can easily purchase a PSN card from them. 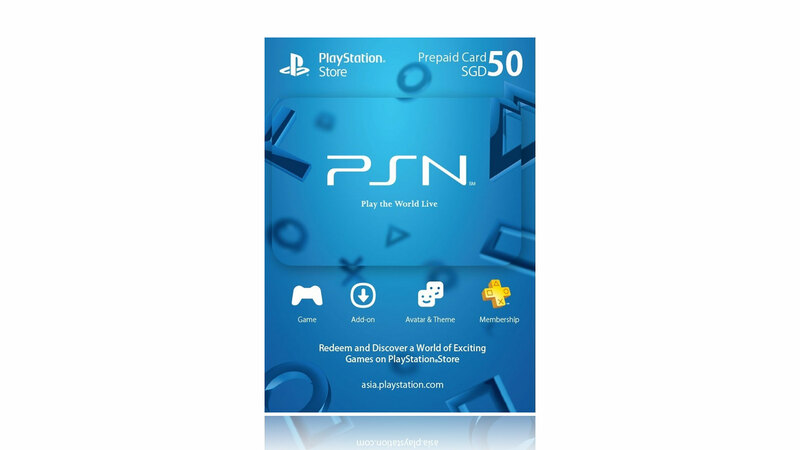 The user just needs to search for the correct card with the proper region and amount, in this case a PSN CARD worth 50 Singapore Dollars (SGD). 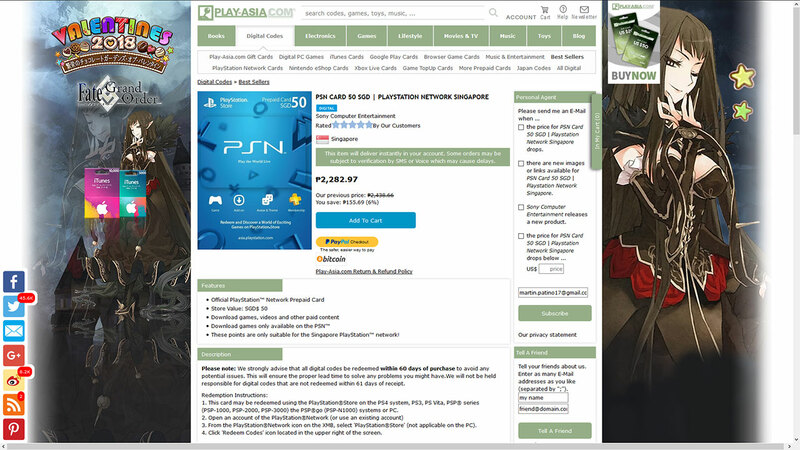 Once a user purchases a PSN card from Play-Asia’s store, the 12-digit code for the card will be listed in the user’s Play-Asia account. 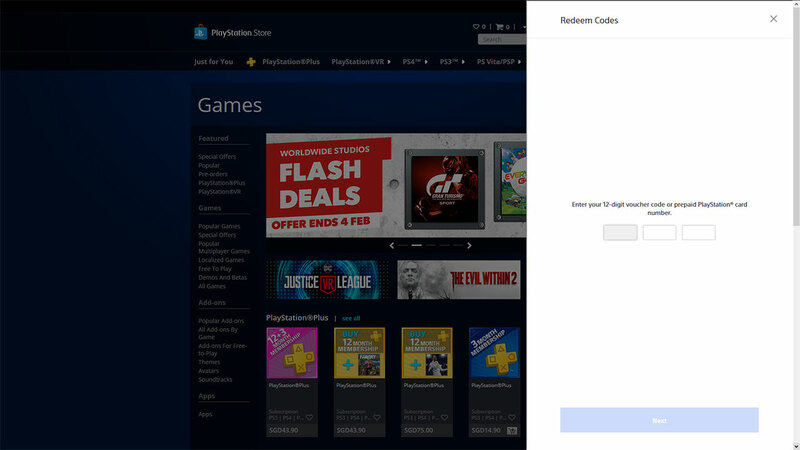 The user can then redeem the 12-digit code on the PS Store directly. Users just need to make sure they login with their Singapore-based PSN account. Then look for the redeem code option in the menu beside their account name on top of the page. Once the code is redeemed, the amount will be credited to the user’s account. 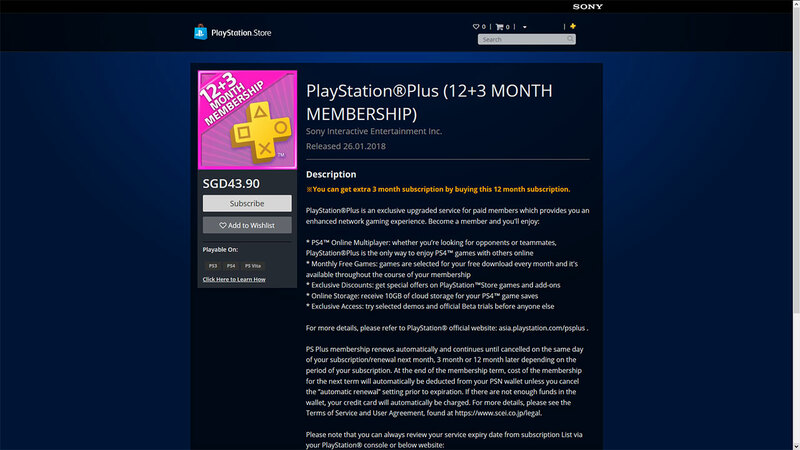 In our case, we purchased a SGD50 PSN card to have enough for the 12+3 PS Plus subscription promotion, which costs SGD43.90. Once the amount is credited to the user’s account, they can then go to the product page of the 12+3 PS Plus subscription promotion and choose Subscribe to go to the payment confirmation page where, if the PSN account has enough load in its wallet, the user can just choose to confirm the payment and the amount will be deducted from the user’s current PS Store wallet. The subscription will then be automatically applied to the account. Users can also purchase other products from the PS Store using their leftover load (we purchased the Monster Hunter: World PS4 Theme with the leftover balance we had in our PS Store wallet) or purchase even more PSN cards from Play-Asia to purchase other products from the PS Store. Additionally, users may also purchase a PS Plus subscription card directly from Play-Asia if the PS Store is currently not running a 12+3 PS Plus subscription promotion or similar.